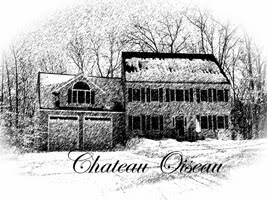 Chateau Oiseau: Fermentation Continues on the Chilean grapes! 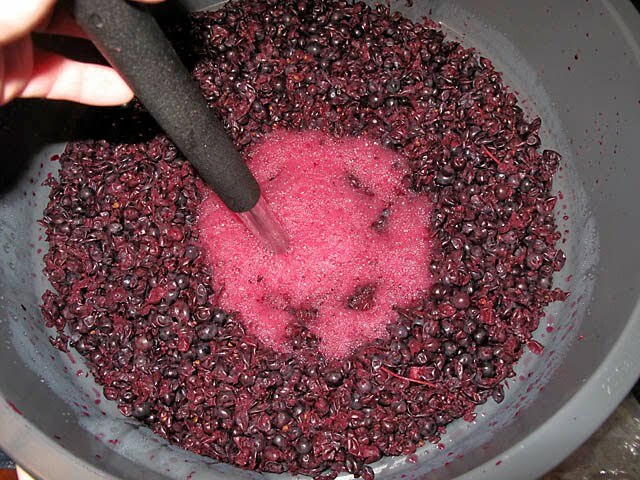 Fermentation Continues on the Chilean grapes! Time for an update on the 2010 Chilean grapes. Fermentation has been going for 5 days on the Pinot Noir and the Malbec. Two nights ago I chaptalized (added sugar to) the Malbec as the must measured only 22 Brix, which is a bit low. Some calculations suggested that about 2 pounds of sugar would be about right. I used unrefined (brown colored) sugar which is a little more natural. My first inclination was to just ferment them at 22 Brix, but the alcohol would be a little low. The problem there is that Malbec is naturally a bit tannic, as it is a big, bold, thick skinned grape like Cabernet Sauvignon, so without the alcohol to counter the tannin, the wine would taste overly tannic and have a strongly astringent mouthfeel. Benoit Germain suggested I chaptalize. When a winemaker from Burgundy tells you what to do, you just do it. So I did it. Once I added the sugar, Brix measured 3.5 points higher. Benoit suggested that I wait until the fermentation was well underway before adding the sugar. So I added the sugar at 15.5 Brix with a solid 80 degree fermentation going and it brought the must up to 19 Brix (3.5 increase) which extrapolates out to making the must as if it started at 22+3.5=25.5 Brix. That should be about right. The Pinot Noir on the other hand was perfect at 24.5 Brix to start with. I did absolutely nothing to the pinot noir. So after 5 days of fermentation, last night the Pinot noir was down to 7.5 Brix and the Malbec (post chaptalization) was down to 15 Brix. They are dropping around 4 Brix a day. One of my QC improvements since the last batch is a temperature controller for the heat on the fermenters. You may recall that my extremely high-tech heating system for the fermenters is just a cheap electric blanket wrapped around them. The problem is that you really can't find a setting on the blanket that keeps the must at the right temperature because the fermentation process is exothermic but not constant. It throws off heat, but the amount of heat it throws off is a factor of how strong the fermentation is. At the beginning, the fermentation is not going strong yet, so you need to add heat to the fermenters to keep the must warm to get it started. Once it gets going, the fermentation heat production goes up. At that point, the electric blanket can be shut off. As the fermentation loses strength, the external heat has to be applied again, increasingly stronger as time goes on, to hold the must temperature up so the fermentation won't stall. So the heat put out by the fermentation over time looks like a bell curve, and the heat that needs to be applied to the fermenters looks like the inverse of that curve (an upside down bell curve.) The temperature controller has a probe you stick in the must and a temperature set point. When the temperature of the must hits the set point, the controller shuts off the electric blanket. When the temperature drops a couple degrees down (also settable) it kicks the blanket back on. It works great! No longer do I have great swings of temperature. The biggest problem I had with my last batch was the heat getting too high and encouraging the growth of bacteria. 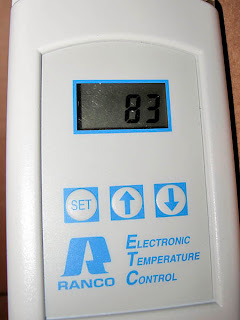 I have my temperature set at 83 degrees with a 3 degree delta so my temperature stays between 80-83 all the time. Perfect. Of course, if I were doing this in my first floor with a nice even 75 degree room temperature, I probably wouldn't need any of this. But in the cellar (temperature currently 62 degrees) it's just too cold to conduct a fermentation reliably. And a cool fermentation like that would not extract much fruit. I enjoy my three times a day punching routine as it gives me a chance to smell the sweet smell of fermentation and have a look at how things are coming along. The cap rises way up between punches. 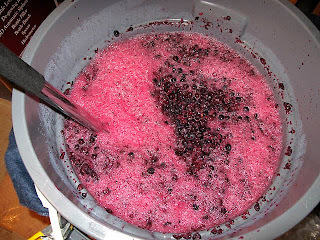 Punching gets the cap back under the juice so the top berries don't dry out or grow mold. It helps extract more flavor and tannin from the skins. However, there is such as thing as punching too much--extracting too much tannin. So I punch three times a day, approximately 9 AM, 3 PM and again before bed. Attached are a few pics. 1. 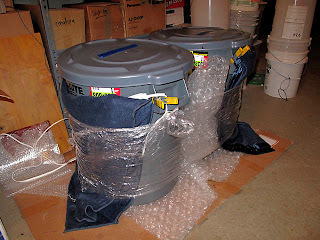 The fermenters wrapped in an electric blanket and some plastic to hold it in place. 2. The readout on the temperature controller. 3. Punching the must--when the punch tool goes through the cap, foam comes up from CO2 underneath. 4. After punching the whole cap, all the CO2 is released from under the cap. Too bad I can't post the wonderful aroma! The 2010 Malbec is pressed! An Amazing Opportunity...and some bad news! Update on the 2009 Pinot Noir!